So, I bought a car that didn't require a front plate, however in my state it is required. I had to get a front plate mount and really didn't want to drill into my front bumper, so I went with the Corksport front tow hook license plate frame. Why Corksport? Really, it was the price. $75 plus shipping. 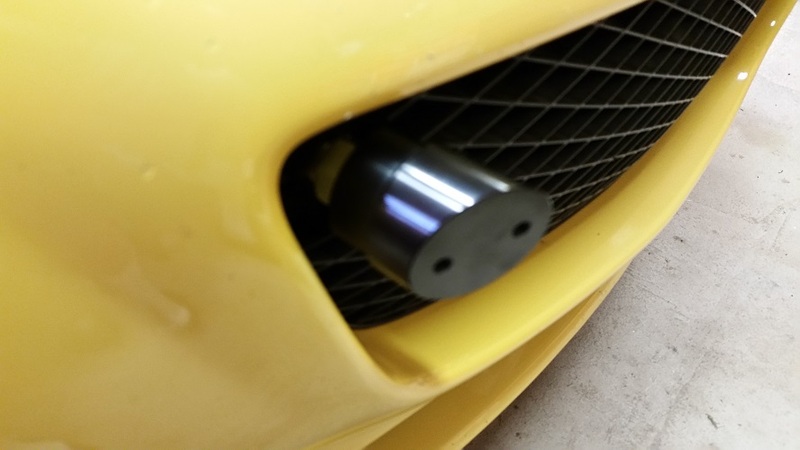 I've had good luck many moons ago with Corksport parts for my FC, when they made FC parts, and really, I didn't trust the ebay frames because they all use pictures from an RX-8 that I know doesn't have an ebay frame on it... because he made a post about the frame he used. I found out AFTER I bout this kit that it is meant for an SII. I was like, "well, I've got it, let's see if it fits anyways." I think it came out ok, but just a forewarning that it is not technically for this car. 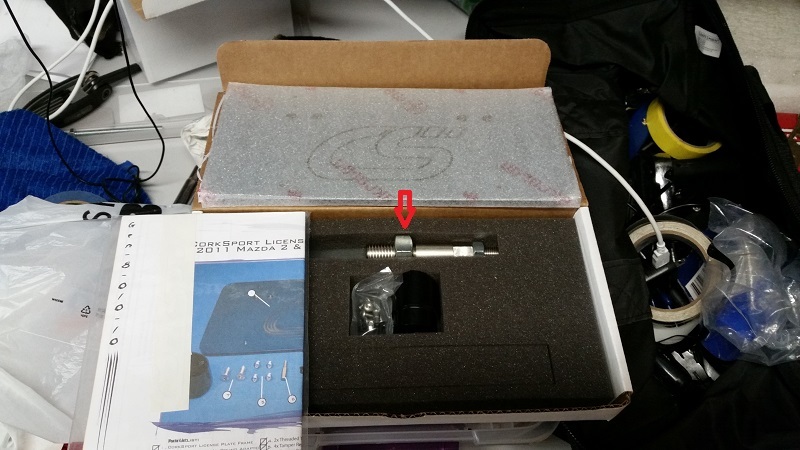 So, the kit comes with everything you'd need to mount the plate, including screws to mount the plate to the frame. It took about 10 minutes to install. 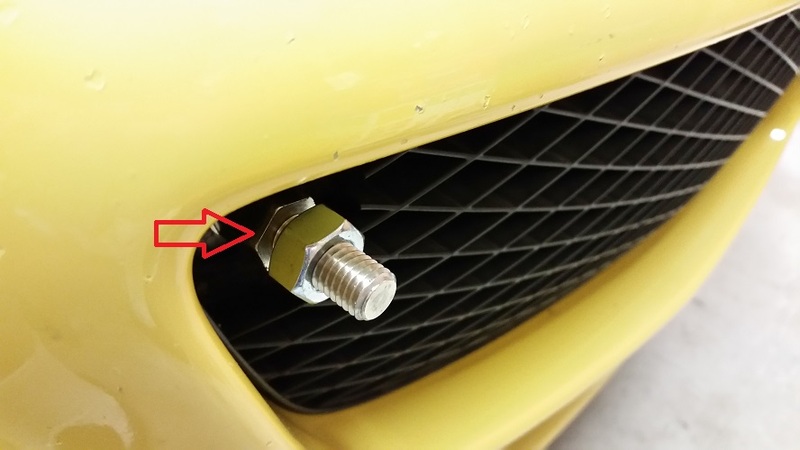 The arrow indicates a locking nut for setting how deep you want the mount bolt to go in. I left it about where it is before hand tightening the stud into the tow hook area, which we'll come back to in a minute. 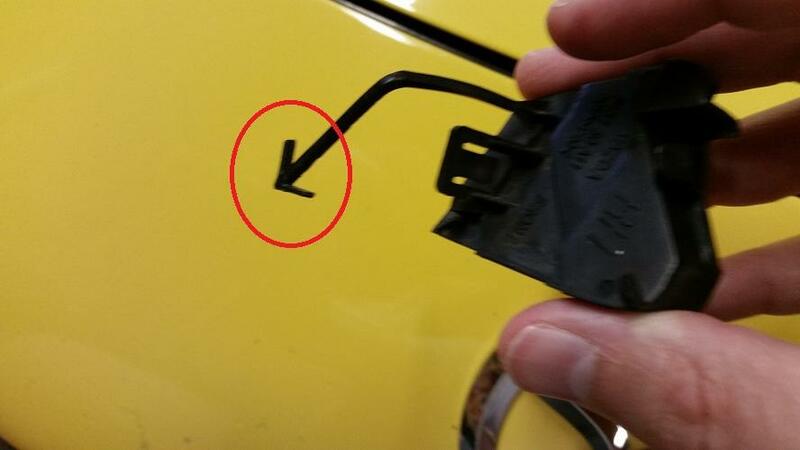 A little blurry, but I'm pointing at the slot to remove for the tow hook. 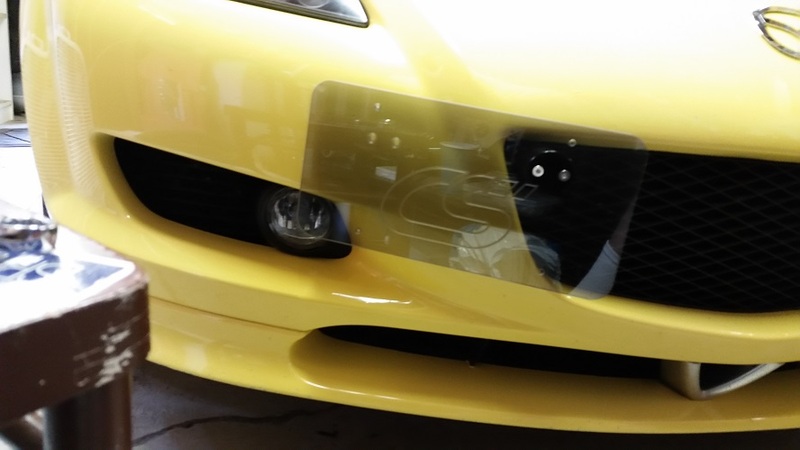 The SI (maybe SII) has two squares that pop out in the top corners of the stock bumpers mesh grill. You can use a flathead screwdriver, or according the owner's manual, the tire iron from the trunk to pry it out. Once it's popped out, it will look something like this. Likely it will be connected by a piece of plastic to prevent it from completely falling out. 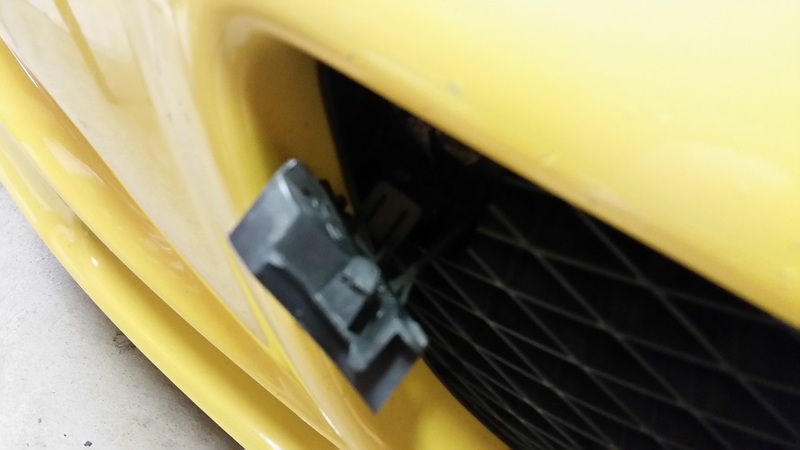 I carefully bent in one of the tabs on the plastic string and pull the connecting piece out from the bumper. If you don't care, you can rip it or cut it. It won't hurt anything else in the bumper. Now, back to hand tightening the stud into the hole for the tow hook. Once it's in as deep as you can get it, you can use a 17mm socket on the piece the arrow is pointing at to tighten it against that locking nut we left on at the beginning. Torque is 40ft/lbs for those who are interested. Afterwards, you slide on the locking nut for the actual plate frame mount. Set the locking nut fairly far back and then hand screw on the black frame mounting piece. Once on and lined up evenly, you can use a 19mm wrench to secure the locking nut against the black frame mount. I found that I had to put the frame mount on then readjust a few times to get the frame to line up straight. Finally, use the tow flat headed allen key bolts to secure the frame to the black frame mount. I beleive the allen key is a 5 or 6, but I'm not positive. I just grabbed one and hoped it fit. Then you are done. 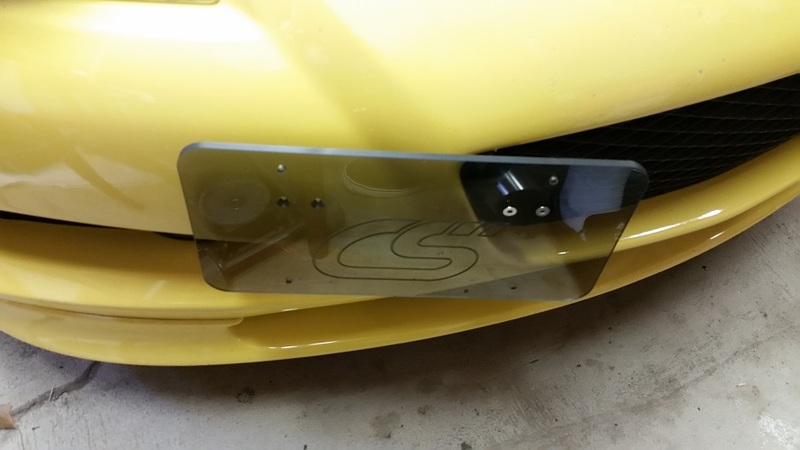 The frame comes with some bolts to use for mounting your plate to the frame. They use a special bit that is included in the kit and will likely be lost by a lot of individuals. I stuck mine in my Mazda manual holder in the glove box for safe keeping. Here's another angle. The frame mounts at an angle that curves with the bumper. I think if you turn the black mounting piece the other way it would stock out straight. I'm ok with my plate mounting like this, so I didn't check how the other way look. Hope you enjoyed, and happy driving all. My image tags didn't load the images for some reason. Here's a link to the image album. Each image has the description of the install process in it.